Braves By The Numbers: Game 1 Recap: Dbacks 6/28/13 "Chipper Jones #10 Retirement"
Game 1 Recap: Dbacks 6/28/13 "Chipper Jones #10 Retirement"
Amazing, amazing night at Turner Field. 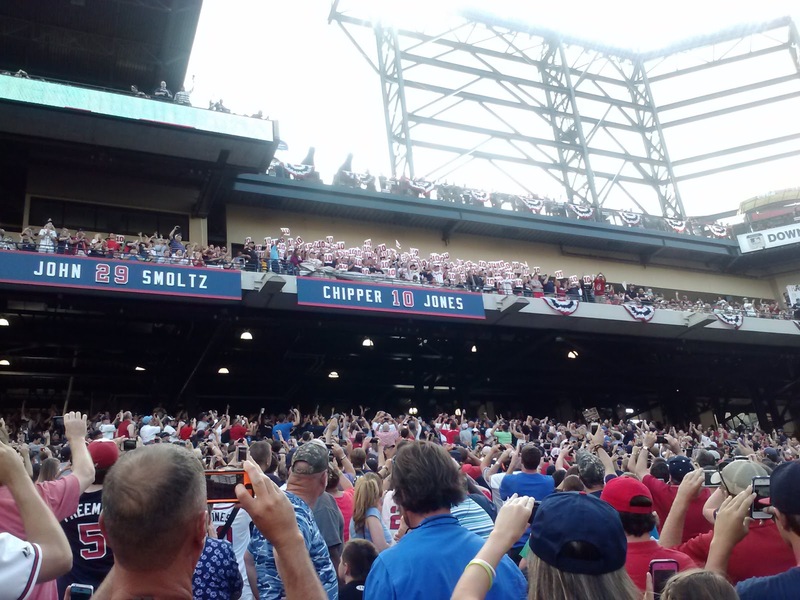 I was blessed enough to be in attendance for the ceremony, including the unveiling of Chipper's number along the ring of honor at the stadium. A picture says a thousand words, so I'll just post that from last night. Our seats were down the 3rd base line right in prime position to see the new plaque. 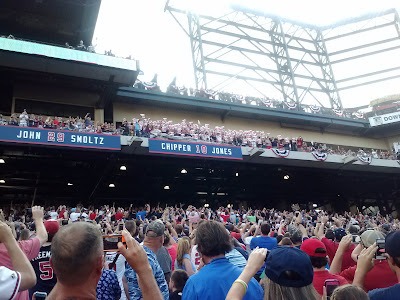 But even after the ceremony, and even after Martin Prado got a standing ovation when Chipper recognized him in his speech, the Braves had a game to win. And win they did, 3-0 on a dominant pitching performance by Julio Teheran. At the beginning of the season in spring training I said, "If he (Teheran) can carry even 50% of his spring potential into the season, he and Medlen may be in a duel for the hot young phenom honors." While Kris hasn't received the win/loss record he'd like, he's currently in the top 20 of NL ERA for starters, along with two other Braves: Mike Minor and Julio Teheran. Julio showed off his prowess last night with a 6 inning, 4 hit, no run, and 10 K performance. He was blowing away Dback hitters with a combination of power and finesse. Add in 3 more innings by the bullpen: Avilan to Walden to Kimbrel, yer out! Braves win! Nobody was going to touch up the Braves staff on Chipper Jones night in the Ted. The hitting wasn't spectacular, but it didn't have to be with Teheran dealing. The Braves posted 11 hits and 5 walks, but only went 2-10 with RISP, and the other run was a solo homer by Simmons. The Braves continue to live on a knife's edge game to game, which drives us all a little crazy. However, they did get the lead early and they did get a home run in the same game. If they combine those two things, and the game is at home? We're practically undefeated on the season. Also, take a look at Dan Uggla's average. Is it? Could it be? YES! He's above the Mendoza line! Let there be a grand clubhouse feast! Bring out the finest meats and cheeses in all the land! Now only BJ remains, sitting at .180 after his two doubles last night (one was a very generous call since the Dback CF completely lost the ball in the sky). Heyward, Uggla, and BJ all had multi-hit games. Justin, Simmons, and Reed Johnson picked up RBIs. The Reed Johnson PH was the thing of beauty. With Uggla's leadoff triple in the 8th, Reed came to the plate with a unique plan. He decided to lay down the perfect safety squeeze to score Uggla. That move caught the Dback defense off guard, and allowed the 3rd run to cross the plate. A little extra insurance never hurts, and it shows that the Braves can actually get to the plate late in the game with a strategy that doesn't include just hacking at the pitch. The CPA correctly predicted a win, and moves to 39-29 on the season. Can the Braves carry the momentum of alumni weekend into game 2? This could be a tighter game unless the Braves get a handle on Kennedy early. He'll give up some hits, and he'll give up some walks, but the Braves have to string those together with RISP to make it count. Also, Hudson has been on the receiving end of some terrible Braves hitting, so you would hope they wake up in time to get him a win.